Two Paddles, Two Balls and Instruction Leaflet. One line engraved on surface, up to 25 characters. Enter information to be engraved during the checkout phase of the ordering process. Box Measures 14" x 7" x 3". 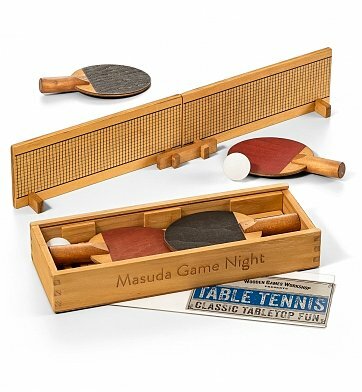 Engraved Wood Table Tennis Set is a hand delivered gift. These gifts are delivered by one of our local design centers located throughout the United States and Canada. Same day delivery is available for most gifts when ordered before the cutoff time. The cutoff time for Engraved Wood Table Tennis Set is 1 PM in the recipient's time zone. Transform any table into a table tennis surface. Complimentary engraving on wooden storage case. Includes a free card with your personal message.